Udaipur: After scaling up the standards in fine dine Pan Asian cuisine across, Chandigarh & Bangalore, OKO, the award winning restaurant at The LalitLaxmi Vilas Udaipur is all set to toss up a culinary storm. The 30 cover speciality restaurant brings to table an amalgamation of iconic preparations from Malaysia, China, Thailand, Indonesia, Vietnam, Korea and Japan. The authenticity of each dish stems from the recipe and fine ingredients sourced from their indigenous lands. As shared by Executive Chef Sudarshan, “being the only true Pan-Asian restaurant in the city, dining at OKO will be an experience of graceful hospitality infused with vibrant ambience. 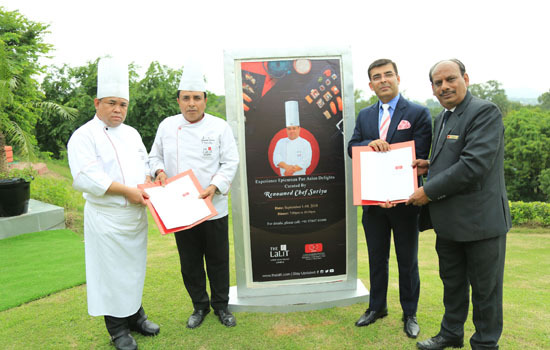 To add to the enthusiasm Master Chef Suriya, from OKO Chandigarh will be in the city during 1st to 10th of September. Chef Suriya will bring with him his spices and ingredients hand-picked from his farm at The LaLiTChandigarh.OKO is also ideal for private group events and is operational during dinners.